The City competes with Maruti Ciaz, which is available in a price range of Rs 7.86 lakh and Rs 9.96 lakh (ex-showroom Delhi). Hence, on a price point at least, Maruti still has the edge. City has been Honda's biggest blockbuster in India and the new avatar launched at the starting price of Rs 8.50 lakh (ex showroom, Delhi) and the top diesel variant at Rs 13.58 lakh, aims to get an edge over the segment leader Maruti Ciaz. 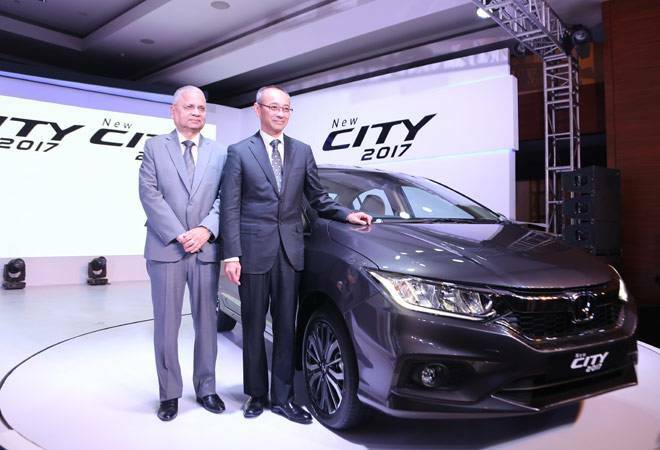 Yoichiro Ueno, President and CEO, Honda Cars India said that they have already booked 5000 City in the pre-launch phase in the past fortnight. "I am confident that with the new City we will regain our leadership position in the segment. It is our most successful model in the country. It has brought joy to over 6.5 lakh customers across the country and has been India's most successful sedan since its launch in 1998." However according to Honda executives, the new City is packed with several new features that will bring back its loyal buyers. Besides a new stylish and sporty exterior design and enhanced safety features, the company has added advanced high-technology infotainment system. The fourth generation City has been built on the 'advanced, energetic and smart' concept, and has advanced integrated LED DRL, in-line LED headlamps, new 16-inch alloy wheels with wider tyres and a touchscreen infotainment system, developed specially for India called the Digipad. "The all-new advanced infotainment system has segment-best features like satellite-linked navigation, voice recognition, Bluetooth telephony, audio streaming, 1.5 GB internal memory, 2 USB-in slots, 2 microSD card slots and 1 HDMI-in slot. It also features the first in segment Wi-Fi support for internet and mirror link support for smart phone connectivity," says Jananeshwar Sen, Honda's senior vice president for marketing and sales. City's importance for Honda is evident from its contribution to the company's sales in India during the last two decades. Almost half of the Japanese auto major's sale in country till date, approximate 1.3 million cars, come from City. To maintain this track record, the new Honda City 2017 will be offered in 5 grades across the petrol and diesel powertrain. It will also have an automatic petrol CVT available in V, VX and the ZX grades. Emphasizing high on safety quotient, the New City 2017 has standard dual SRS front airbags, anti-lock brake system (ABS) with electronic brake distribution (EBD), 3-point ELR seat belts with pretensioners and load limiters, impact mitigating front head rest system, pedestrian injury mitigation technology and compatible rear seats. Honda has introduced a new flagship City ZX variant, offering best-in-class, which has 6 airbags - front dual airbags, both side curtain airbags and both front seat side airbags along with automatic headlights, headlamp auto-off timer and automatic rain-sensing wipers. City sales went down 34 per cent to 39,040 units during April-December, and this decline also reflected in the overall car sales of the company, which declined 23 per cent to 124,114 vehicles till January this fiscal.